Heroes-4-Higher Batman and Wonder Woman visit Guiding Hand School students and share message of inclusion, respect and doing the right thing earlier this year. GALLIPOLIS — With the majority of yes votes tallied to approve the Gallia County Board of Developmental Disabilities levy Tuesday evening, Guiding Hand School will likely remain open to serve the child-age population of Gallia County individuals with developmental disabilities and the board’s superintendent, Pamela Combs, couldn’t be happier. The Gallia County Board of Developmental Disabilities one mill levy increase led with yes votes at 3586 to 2200. Had the levy led with no votes, Combs said a few months ago she was certain the school would close. Guiding Hand School has served as both the administrative offices for the board as well as a school for area Head Start students and school age students utilizing the board’s services. While the school’s operation was an issue at the front of the board’s mind, the levy will go to fund all board services. Combs also said the board would be resubmitting its proposed 2018 operating budget to the commissioners as it had not included Guiding Hand School expenses previously. According to Combs, the board previously operated on a levy of 1.8 mills. The board’s overall budget sat at $2.7 million with the 1.8 mill levy bringing in $1,223,547. With the levy’s apparent approval of another mill of funding, it will bring in roughly an additional $800,000. The rest of the board’s budget is compromised of state funding from the Ohio Department of Education to run the school and correlates to students who would have been attending the public school system. Combs said Gallia was among the lowest of mill levy totals received by a county board of developmental disabilities throughout the state previously. Her reports states Gallia is the 85th lowest out of 88 counties across the state. While funding will go on to maintain services currently in place, Combs said the board could potentially hire an early intervention specialist to meet the growing demand of recent spikes in children discovered to have developmental disabilities. Gallia Board of Developmental Disabilities Community Integration Specialist Angie Williamson previously told the Tribune that around 10 years ago, babies in Gallia Board of DD programs born under drug abuse conditions numbered at zero. In 2015, the board served four such children. In 2016, the board registered 15. In 2017, they registered 25. The board anticipates serving potentially 50 such children in 2018. The new specialist would help coach area families in the raising of their child as well as report findings to the board. 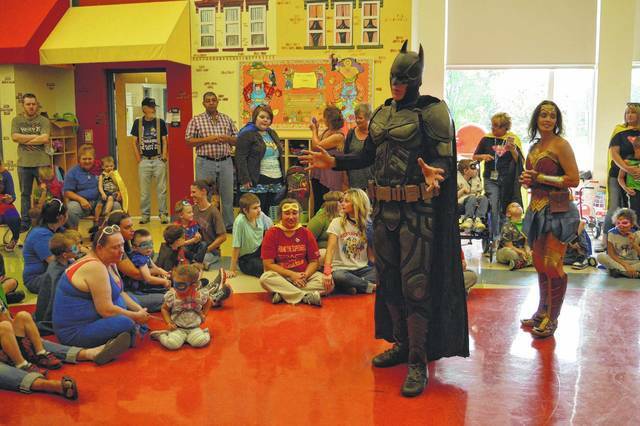 https://www.mydailytribune.com/wp-content/uploads/sites/42/2017/11/web1_DSC_0696.jpgHeroes-4-Higher Batman and Wonder Woman visit Guiding Hand School students and share message of inclusion, respect and doing the right thing earlier this year.